THE CORN DOCTOR OF GOTHAM. are as tender as her feet. Detective stories have been around for centuries. But even as a source of entertainment, their appeal has evolved over time. The advent of the steam press in the early 19th century made the first cheap newspapers and serials affordable to the masses. This “penny press” seized on the popularity of crime stories and set about to feed the public’s interest. 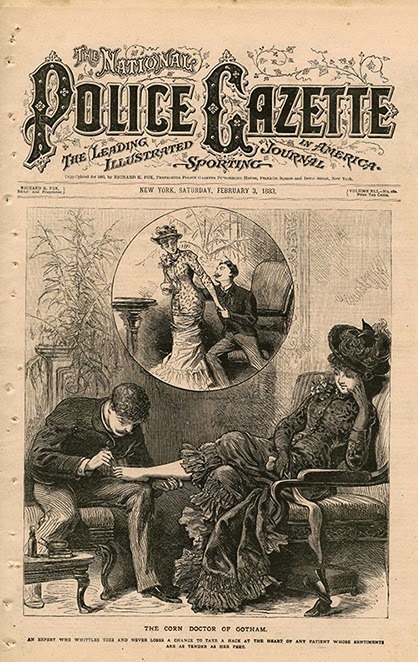 One such publication was the Police Gazette. When first published in 1845, it saw itself as a newspaper “devoted to the interests of criminal police.” These noble intentions, however, did not last long, and within a few years, the Gazette had lost all pretensions of being anything but a sensational crime rag. Around this same time, the depiction of crime transformed from somber moral stories to titillating tales. Even the accompanying illustrations became more graphic and excessive, eventually evolving into the more realistic styles and depictions seen in recent true crime books and pamphlets. During the mid-1800s, the fascination with these stories was edged with fear, as Americans became increasingly distrustful of the burgeoning immigrant populations in major US cities. Sensational headlines in newspapers touted crime as a problem and the abolition of the old, corrupt, inept watch system and the creation of a new full-time professional police as its solution. The news media’s focus on crime and the inadequacies of the crime prevention system led to police reforms in most the major cities.